Acknowledged author American Psychiatric Association wrote Diagnostic and Statistical Manual of Mental Disorders, Fifth Edition (DSM-5(TM)) comprising 947 pages back in 2013. Textbook and etextbook are published under ISBN 089042554X and 9780890425541. 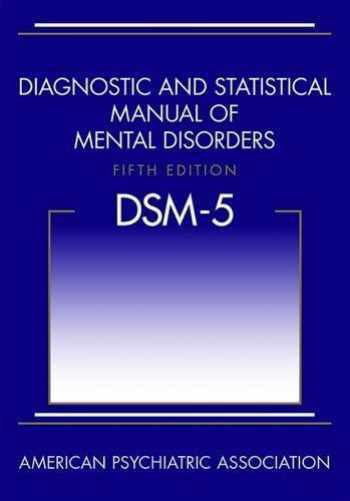 Since then Diagnostic and Statistical Manual of Mental Disorders, Fifth Edition (DSM-5(TM)) textbook received total rating of 4.5 stars and was available to sell back to BooksRun online for the top buyback price of $62.54 or rent at the marketplace. This new edition of the American Psychiatric Association s Diagnostic and Statistical Manual of Mental Disorders (DSM-5), used by clinicians and researchers to diagnose and classify mental disorders, is the product of more than 10 years of effort by hundreds of international experts in all aspects of mental health. Their dedication and hard work have yielded an authoritative volume that defines and classifies mental disorders in order to improve diagnoses, treatment, and research. This manual, which creates a common language for clinicians involved in the diagnosis of mental disorders, includes concise and specific criteria intended to facilitate an objective assessment of symptom presentations in a variety of clinical settings inpatient, outpatient, partial hospital, consultation-liaison, clinical, private practice, and primary care. The Diagnostic and Statistical Manual of Mental Disorders, Fifth Edition, is the most comprehensive, current, and critical resource for clinical practice available to today's mental health clinicians and researchers of all orientations. The information contained in the manual is also valuable to other physicians and health professionals, including psychologists, counselors, nurses, and occupational and rehabilitation therapists, as well as social workers and forensic and legal specialists. DSM-5 is the most definitive resource for the diagnosis and classification of mental disorders.